Written by experts who have been part of this field since its beginnings in both research and academia, this textbook introduces readers to this evolving topic and the broad range of applications that are being explored. 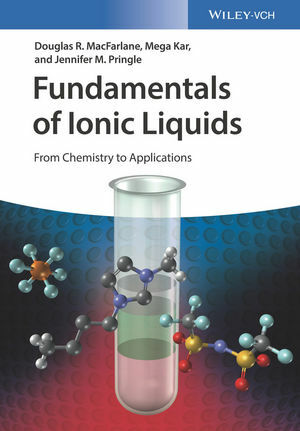 The book begins by examining what it is that defines ionic liquids and what sets them apart from other materials. Chapters describe the various types of ionic liquids and the different techniques used to synthesize them, as well as their properties and some of the methods used in their measurement. Further chapters delve into synthetic and electrochemical applications and their broad use as "Green" solvents. Final chapters examine important applications in a wide variety of contexts, including such devices as solar cells and batteries, electrochemistry, and biotechnology. The result is a must-have resource for any researcher beginning to work in this growing field, including senior undergraduates and postgraduates. Professor Doug MacFarlane leads the Monash Ionic Liquids Group at Monash University. He is currently the holder of an Australian Research Council Laureate Fellowship. He is also the Program Leader of the Energy Program in the Australian Centre of Excellence for Electromaterials Science. His group focuses on a range of aspects of ionic liquids and their application in the energy sciences and sustainable chemistry. Professor MacFarlane was a BSc(Hons) graduate of Victoria University of Wellington, New Zealand and then undertook his graduate work in the Angell group at Purdue University, Indiana, graduating in 1983. After postdoctoral fellowships in France and New Zealand he took up an academic position at Monash. He has been a Professor of Chemistry at Monash since 1995 and was Head of School 2003-2006. A/Prof Jennifer Pringle is a Senior Research Fellow in the Institute for Frontier Materials at Deakin University, and a chief investigator in the ARC Centre of Excellence for Electromaterials Science. She received her degree and PhD at The University of Edinburgh in Scotland before moving to Monash University in Melbourne, Australia in 2002. From 2008-2012 she held an ARC QEII Fellowship, investigating the use of ionic electrolytes for dye-sensitized solar cells. A/Prof Pringle moved to Deakin University, Melbourne in 2013. There she leads research into the development and use of ionic electrolytes for applications including thermal energy harvesting and solid state lithium batteries. Dr. Mega Kar is a Research Fellow in the Monash Ionic Liquids group. She completed her undergraduate degree with honours at The University of Melbourne in 2008. She then went onto study her doctor of philosophy (PhD) at Monash University in Professor Douglas MacFarlane?s group, which focused on designing novel room-temperature alkoxy-ammonium based ionic liquids as electrolytes for reversible zinc electrochemistry, working towards a rechargeable metal-air battery for energy storage applications. Dr. Kar is currently a Research Fellow at Monash University, lecturing and specializing in IL synthesis and electrochemistry, working on electrodeposition and metal batteries.